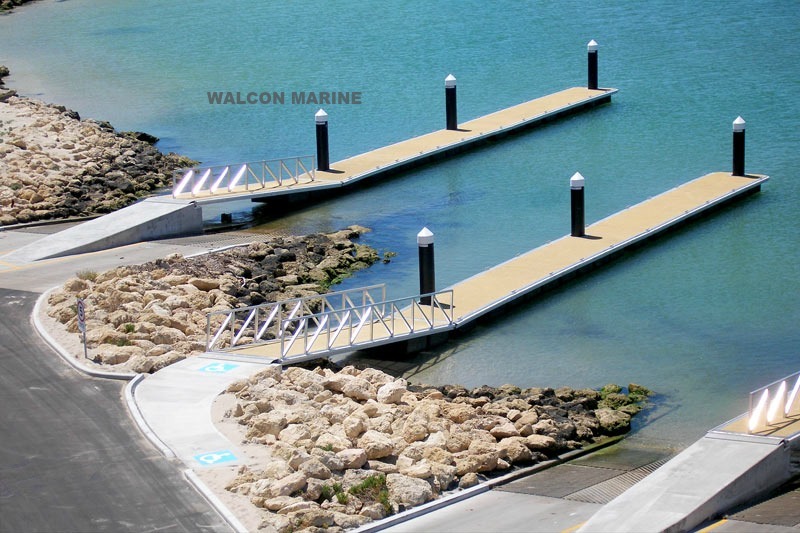 Walcon Marine worked closely with the City of Rockingham to refurbish the Point Peron boat ramp and launching facility. This project was completed in October 2012. The work completed at Point Peron is regarded as one of the best facilities in Western Australia and includes two twin-lane boat ramps and pontoon systems. In addition, a central access pontoon system which is specifically designed to cater for disabled access to vessels. Also included was demolition of the existing timber fixed ramp structures and redesigning the abutments to suit Walcon’s replacement pontoons. As one of WA’s busiest ramp facilities, Walcon managed the project efficiently to ensure the boating community were not hindered. Consequently, one boat ramp was kept open at all times which allowed the site to remain operational. The Point Peron facility experiences up to 500 vehicle/boat movements per day and Walcon’s heavy-duty system has proved to be reliable, sturdy and structurally sound. If your boat ramp requires refurbishment or replacement, contact us on 1300 627 462.